PEARL SK910C EDUCATIONAL SNARE KIT The perfect start to successful percussion playing begins with high quality instruments. Pearl Educational Kits contain superior components that are easy to assemble. The new 910 SK Steel Snare has a professional feel and full size format that help make these kits the best choice for your young beginner. The components of each kit store away for easy transport in their own custom made carrying cases designed with durable reinforced zippers, Heavy Duty Retractable Handles and wide -stance easy roll wheels, convenient pouches, and compact size. 14"x 5.5 " Steel Shell Snare with Black finish EKS1455 14" x 5.5" Steel shell snare drum for the best playing experience. Padded Rolling Case with Retractable Handle SKBC91 Custom fit padded rolling bag with wide-stance easy roll wheels and Heavy Duty Retractable Handle. 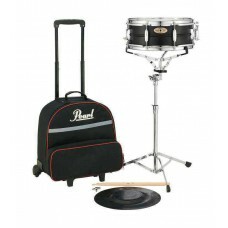 Pearl Educational Kits offer every percussion student a great start with superior components and easy transport features..
Al uw slagwerk op de webshop van Excel Music Instruments. Akoestisch drumstel, elektrisch drumstel, snare drums, bass drums, cymbals, hi-hats, crashes, rides, chinas, splashes, percussie, cajons, beatring, cowbell, stokken, brushes, mallets, vellen, hardware. In onze webwinkel vind u de merken: sonor, adams, pearl, ludwig, dw drums, vic firth, pro-mark, vater, remo, evans, zildjian, sabian, aa meinl, paiste.